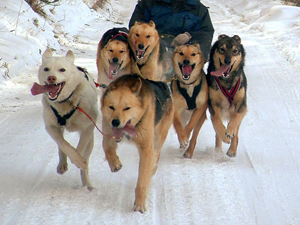 In the afternoon (around 3-4pm) you'll start your journey from Listvyanka to the Chernaya Valley on dog sleds. 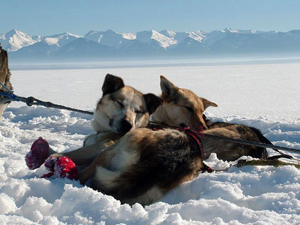 While dog-sledding on the Lake Baikal ice, enjoy the view around. Snack and hot tea on the way. In the evening you'll arrive at the Chernaya Valley. Check-in to the tourist resort. Dinner. Overnight. Breakfast. 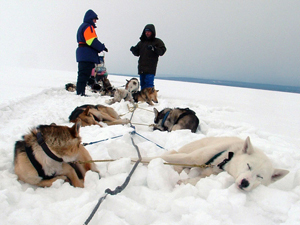 A dog ride back to Listvyanka. If the weather allows, you'll take another road back to Listvyanka through the Taiga forest. Arrival in Listvyanka in the afternoon. To enjoy this ride with all your heart, youпїЅll need to dress warm. It would be best if you wear warm and non-tight clothes, gloves, non-slip flat shoes, and a balaklava. YouпїЅll be also given a warm one-piecer, jacket, and gloves.